Poached chicken is tender, moist, juicy, and delicious. This recipe produces the best poached chicken I’ve ever tasted. The spices added and the precision of timing are what makes the chicken so perfect. As you know, poached chicken has so many different applications. You can use a breast with the bone still intact, but a boneless, skinless breast produces a nicer outcome. I use the simple aromatics of garlic, thyme, salt, and pepper. You can use whatever you want, however. For example, you could use onions, ginger, rosemary, parsley, etc. The list is endless. It’s critical that you stick to the suggested times. If you reduce the time, the chicken will be undercooked. On the other hand, if you boil, simmer, or leave it in the water too long, the chicken will be rubbery. If you’re not going to use the poached chicken right away, put it in a container and place it in the fridge. Remember, after you take it out of the water, it’s going to continue to cook. Add the chicken to a pot which is large enough for the chicken not to be crowded. Pour the water in. There should be about an inch of water over the top of the chicken. Turn the heat to high. Add in the whole garlic cloves, thyme, whole pepper corns, and salt. Bring the water to a rolling boil. After a boil, reduce the heat to low, give the spices a stir, and scrape any scum away from the top. Allow the chicken to simmer for 10 minutes. You want just a few bubbles coming from the center of the pot. After simmering, turn the heat off, place a lid on, and allow the chicken to sit in the hot water for an additional 10 minutes. 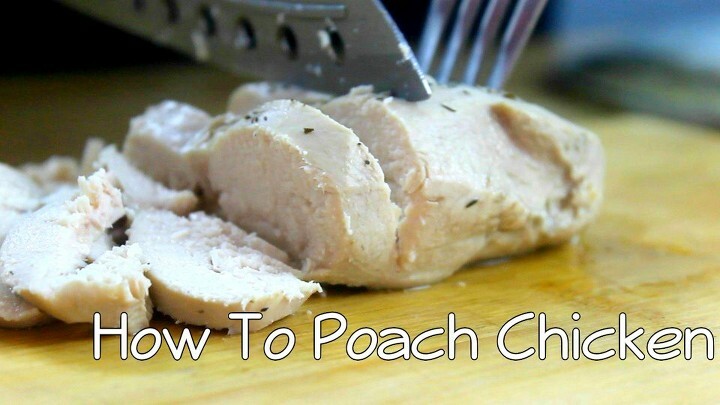 Remove the chicken from the water, serve, and enjoy your poached chicken.